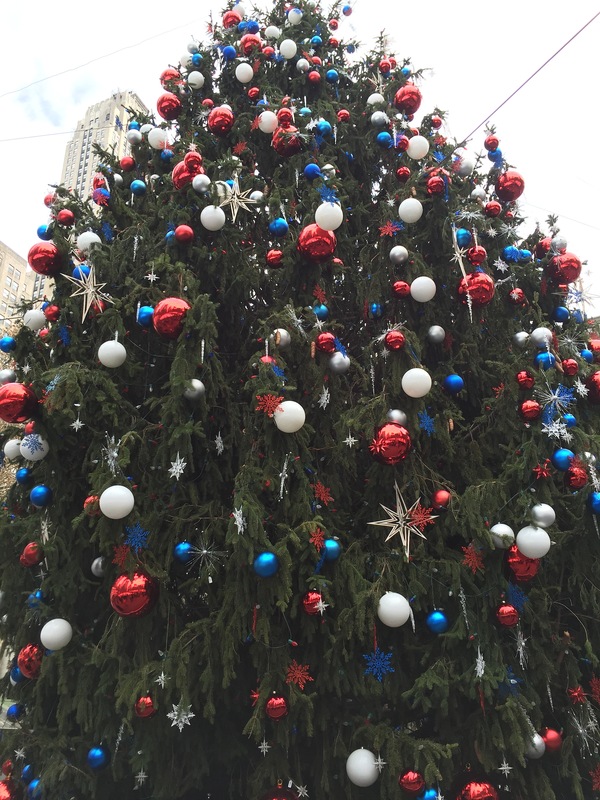 There are few things I love more than visiting New York City during the holidays. To be honest, I love visiting New York any time of the year, but between Thanksgiving and New Year’s, with the city dressed in its holiday best, it’s even more breathtaking. Central Park turns into a winter wonderland with millions of twinkling white lights blanketing the trees and red bows and mini wreaths adorn the horse-drawn carriages. 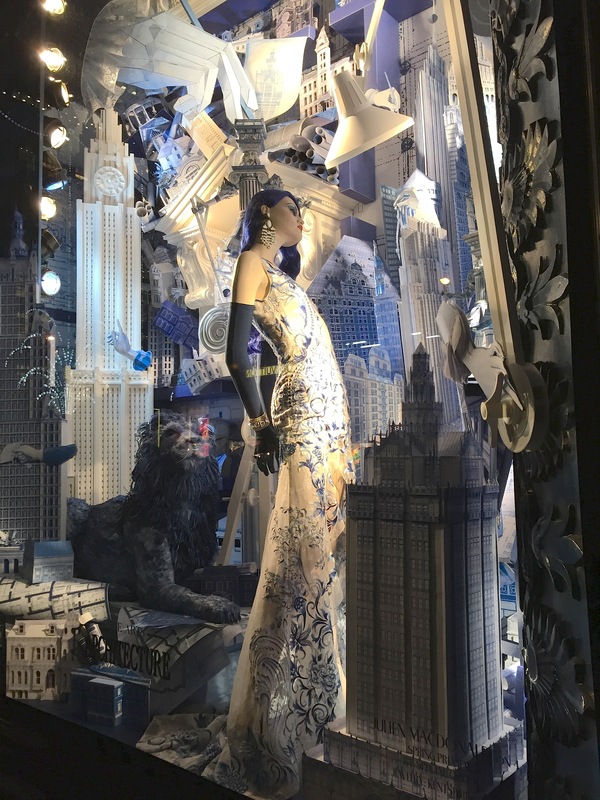 The department store windows on Fifth Avenue are dressed for the holidays (literally!) and food carts sell roasted chestnuts on every corner. Rockefeller Center transforms into a magnificent display with trumpeting angels illuminating the path to the enormous ice-skating rink and iconic 80-foot Christmas tree below. In short, it’s magical. And I was over the moon to take an impromptu weekend trip to Manhattan earlier this month. Below are some of the highlights of my visit. I will share more details in the next post. Hope you enjoy! 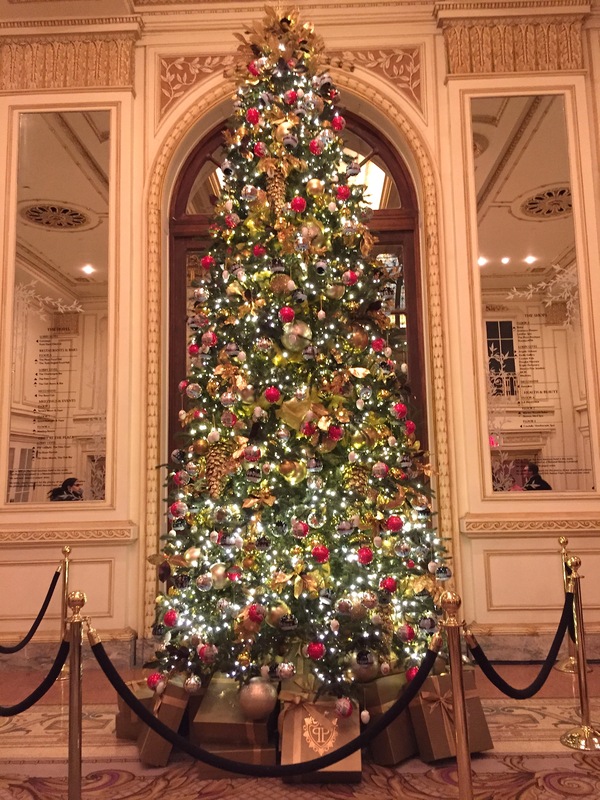 The gorgeous tree in the lobby of the iconic Plaza Hotel gave the entire room a soft, golden glow. 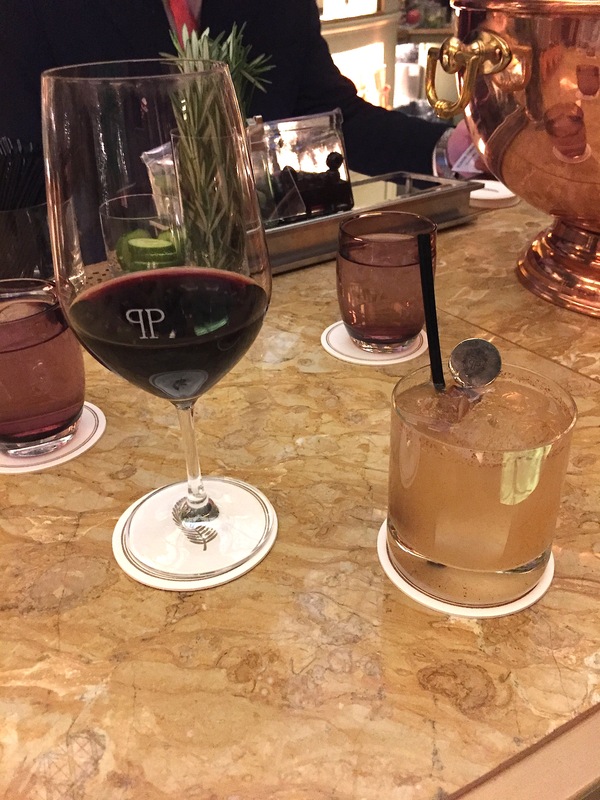 We stopped by the Palm Court at the Plaza Hotel for a cocktail before dinner at Gramercy Tavern. The Palm Court is a beautiful dining space near the front of the Plaza Hotel with a domed back-lit stained glass ceiling, plush seats, and a round marble bar in the middle. I had a glass of Seven Falls Winery Merlot and B had the House Cider Rules with Don Julio Reposado tequila, agave nectar, lemon juice, fresh apple cider, and cinnamon powder. The House Cider Rules tasted exactly like autumn in a glass. Delicious! 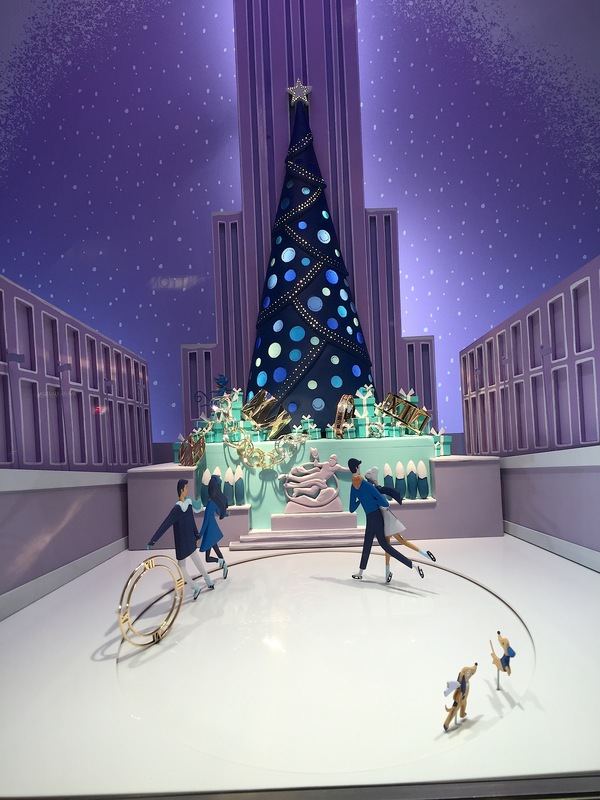 The Winter Village at Bryant Park includes a large ice-skating rink and pop up collection of 125 boutique holiday shops featuring artisans who offer everything from local foods, handmade jewelery, and decorative items throughout the holiday season. 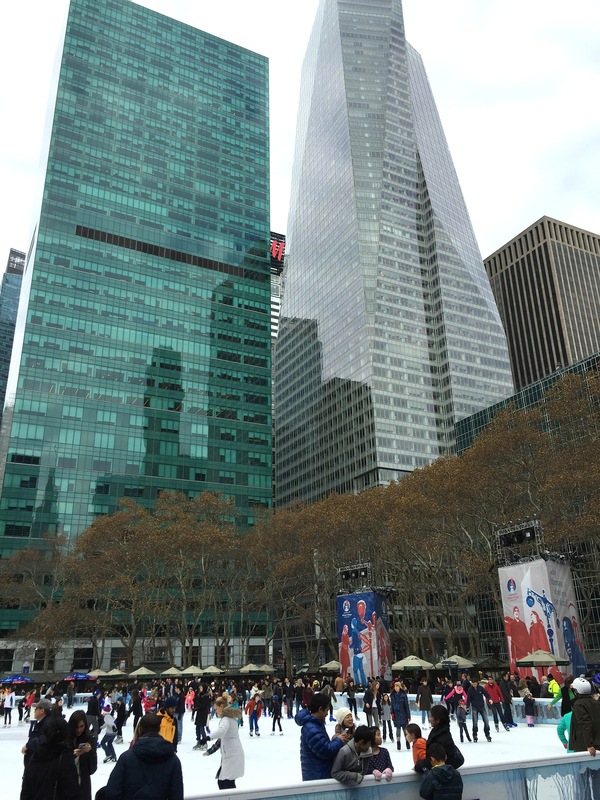 The ice skating rink at the Winter Village at Bryant Park. 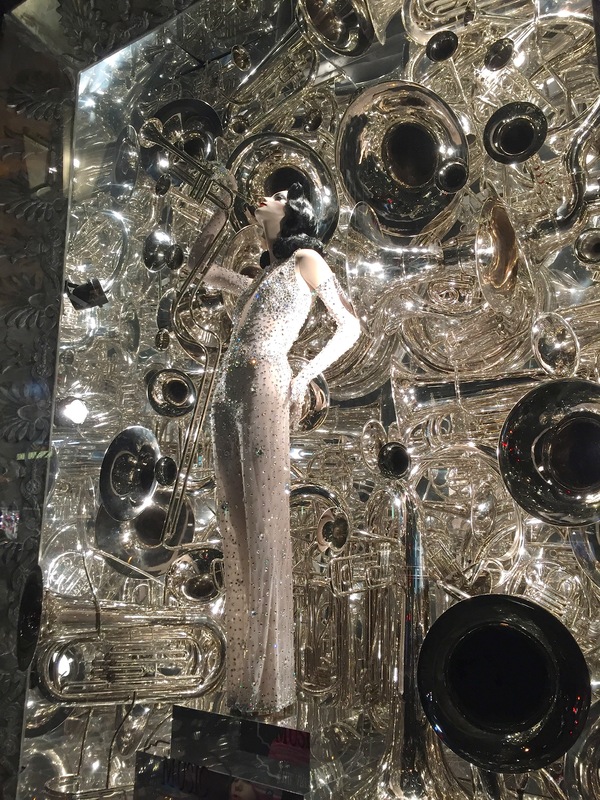 We walked by on our way to Rockefeller Center and I couldn’t resist a peek in the holiday shops. Then we took a break on a bench near the Bryant Park tree with a cup of hot chocolate and a full view of the skaters and shoppers whizzing by. It was a great way to spend the afternoon. 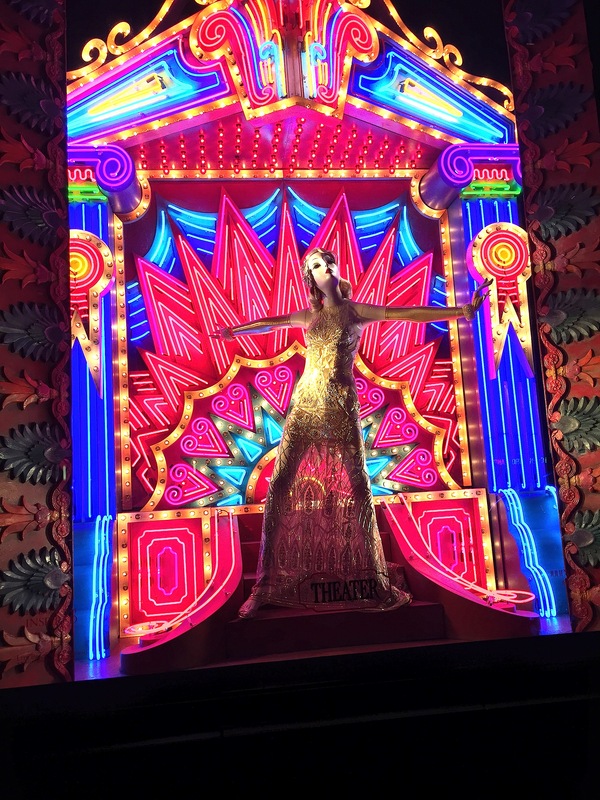 Hands down, the department stores’ holiday window displays are one of favorite things about the holidays in New York. 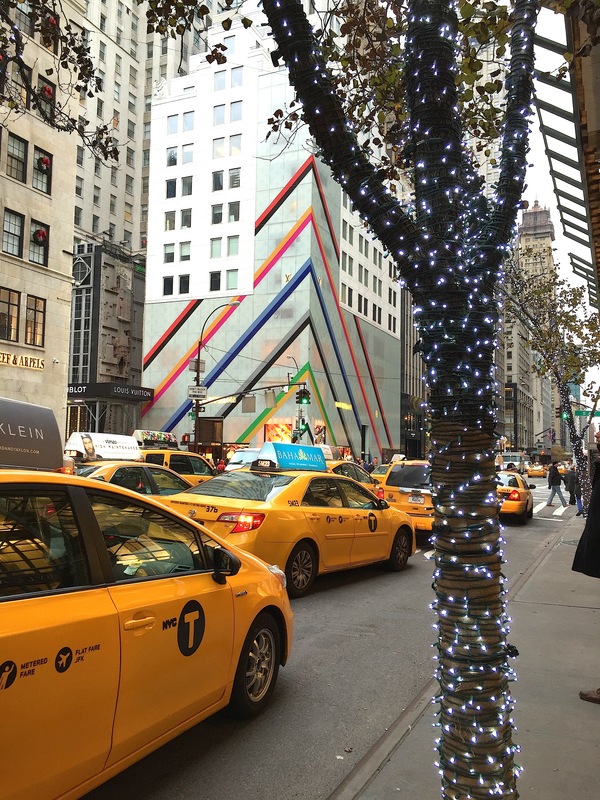 Anytime I am in the city between Thanksgiving and New Year’s, a walk along Fifth Avenue is a must. 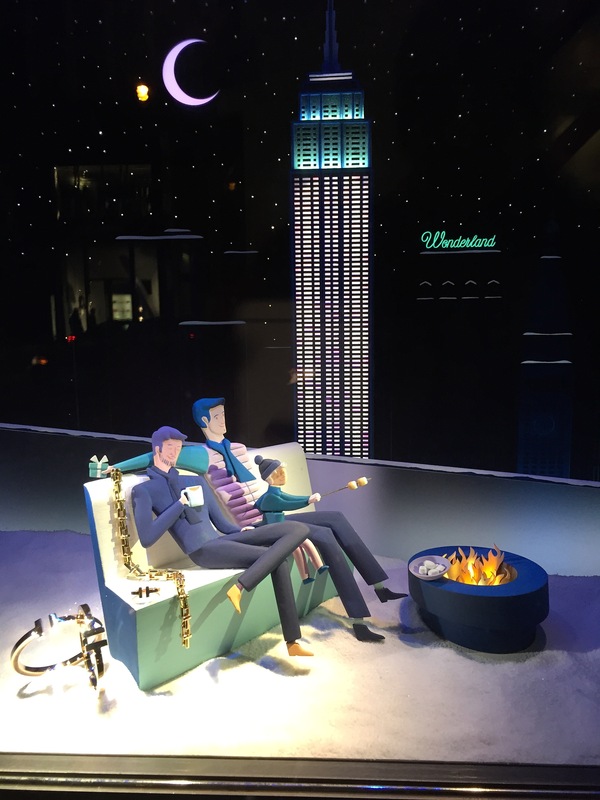 One of the highlights for me this year are the Tiffany & Co. windows. 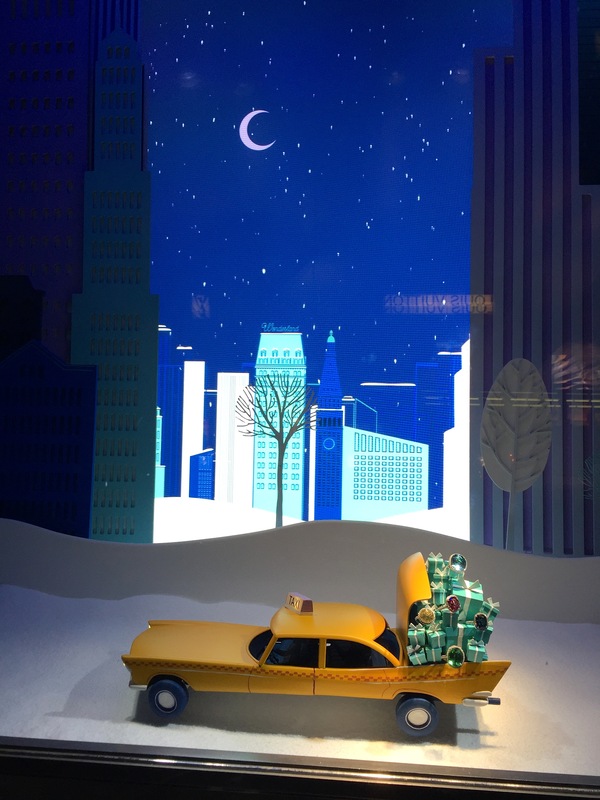 Tiffany’s created various winter scenes inspired by 1950s/60s New York City, complete with moving figures and meticulously placed iconic Tiffany’s robin egg blue boxes. 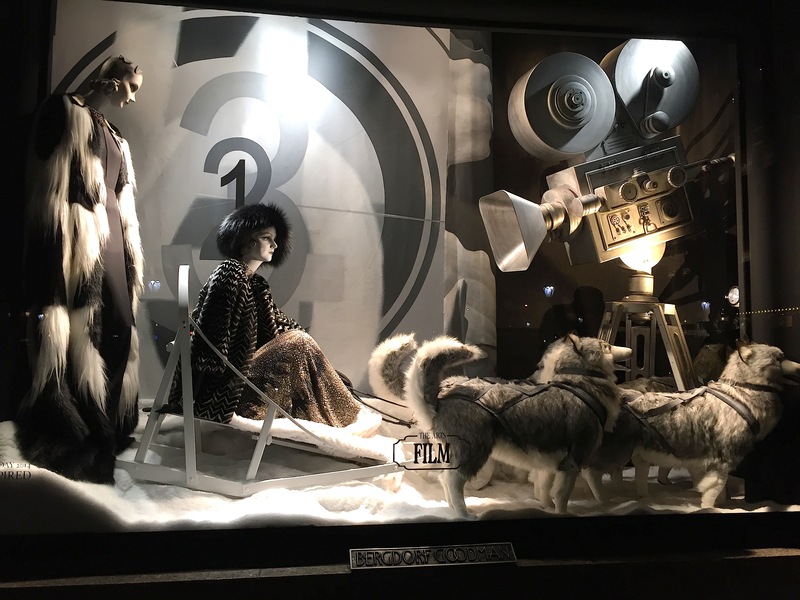 Scenes include ice skating at Rockefeller Plaza, enjoying a roaring fire in a high rise with views of the Chrysler Building, and a vintage yellow taxi brimming with the spoils of a Tiffany’s shopping spree (of course). Here’s a peek at a few. 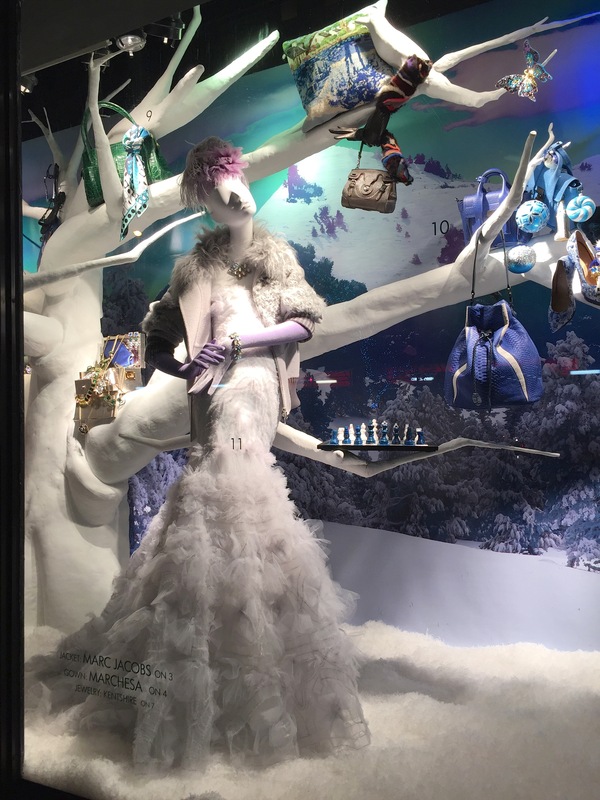 Van Cleef & Arpels created its own version of winter scenes. 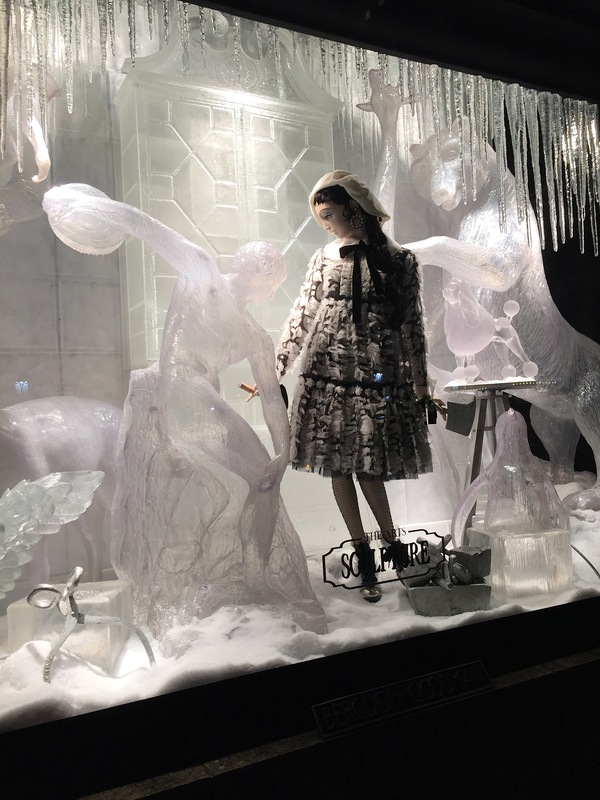 Bergdorf Goodman’s one-word theme for its holiday window display this year is Inspired. 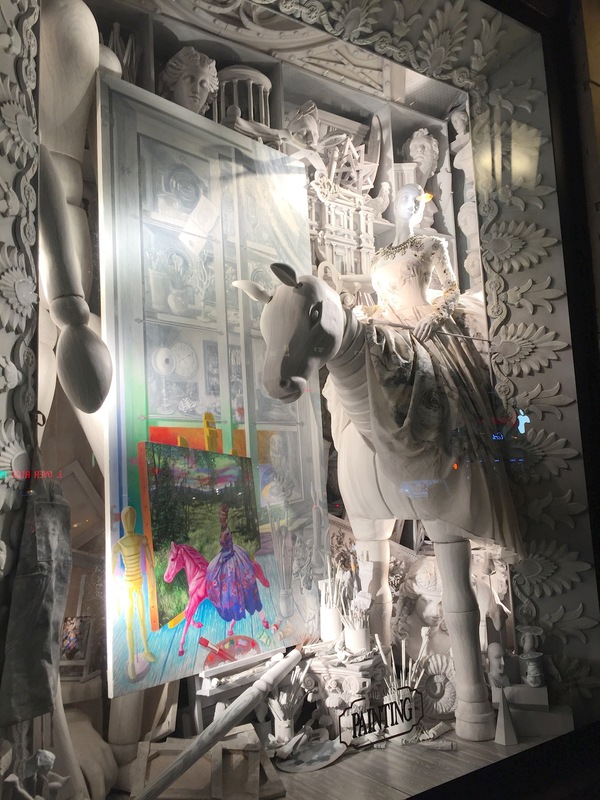 The retailer features a series of windows inspired by the fine arts, performing arts, and applied arts. 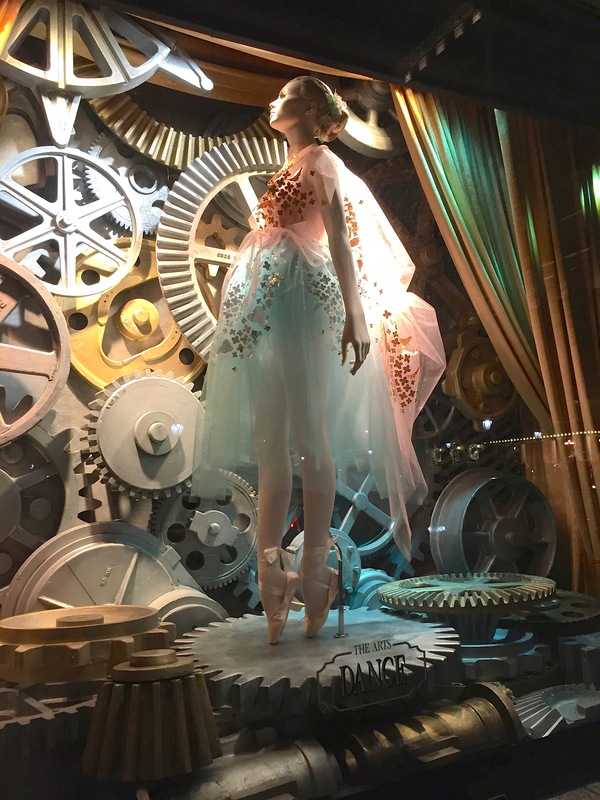 Each window showcases a different aspect of the arts including literature, architecture, theater, painting, music, dance, sculpture and film. 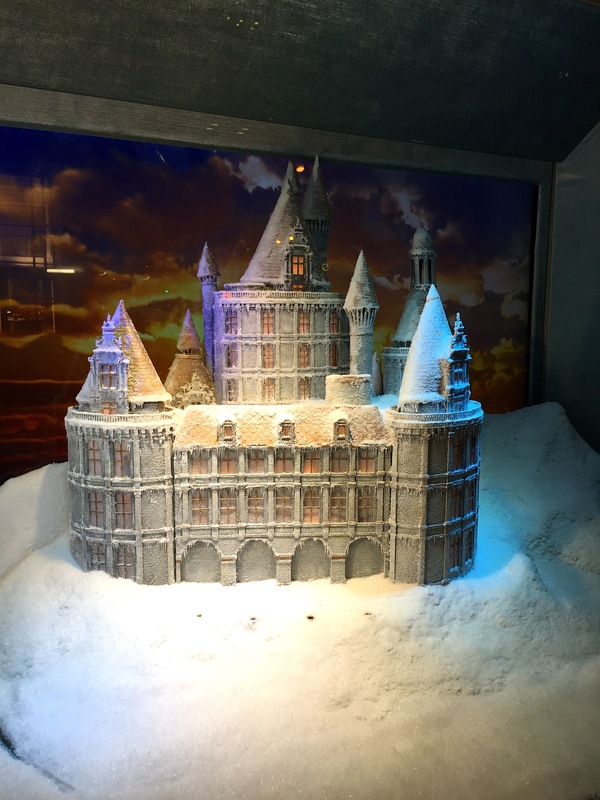 These windows were some of the most extravagant. Among other things, each one featured gorgeous designer clothing and incredible attention to detail. That’s it for now. More from my NYC trip to come soon. I hope everyone is having a wonderful holiday season!